Beneath the frontier island paradise of Samar is a realm of exquisite beauty. It is a fragile place where time is in suspended animation, its raw magnificence carefully preserved in glittering crystals. It is a domain of grandeur and enigmas where one can actually see the process of Mother Nature giving birth to the foundations of our planet. 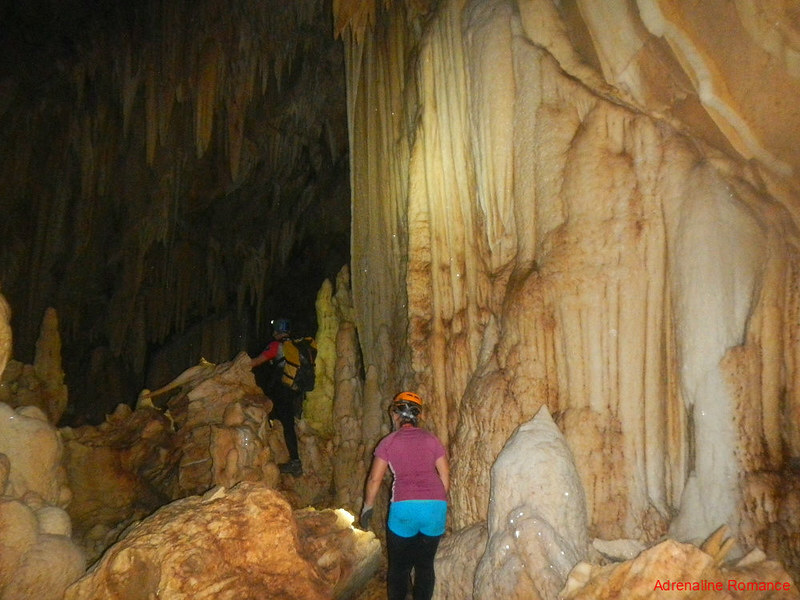 This is the Central Cave, an underground crystal paradise, and one of the most beautiful caves in Samar. 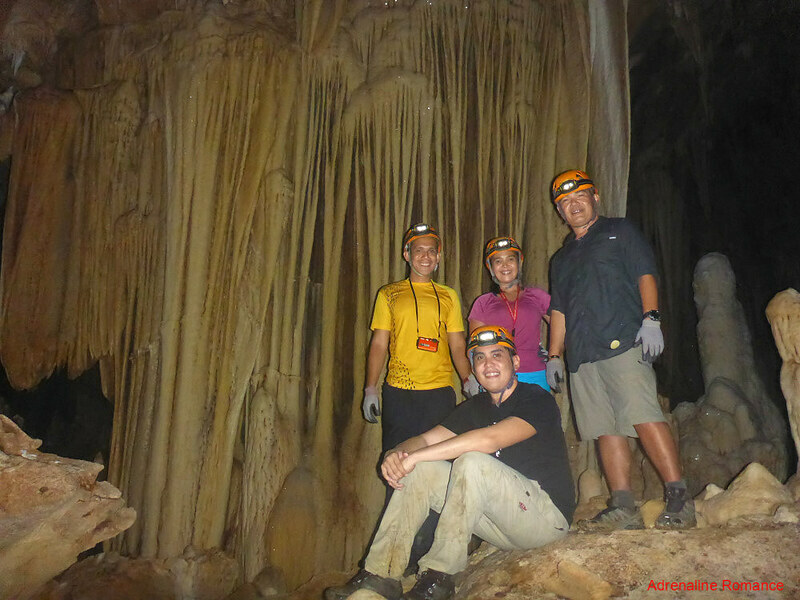 Central Cave is located 8 kilometers away from Catbalogan City. It was discovered and surveyed in May 2014 by Joni Abesamis Bonifcacio of Trexplore and Elezar Labtic of Huplag Speleologists. 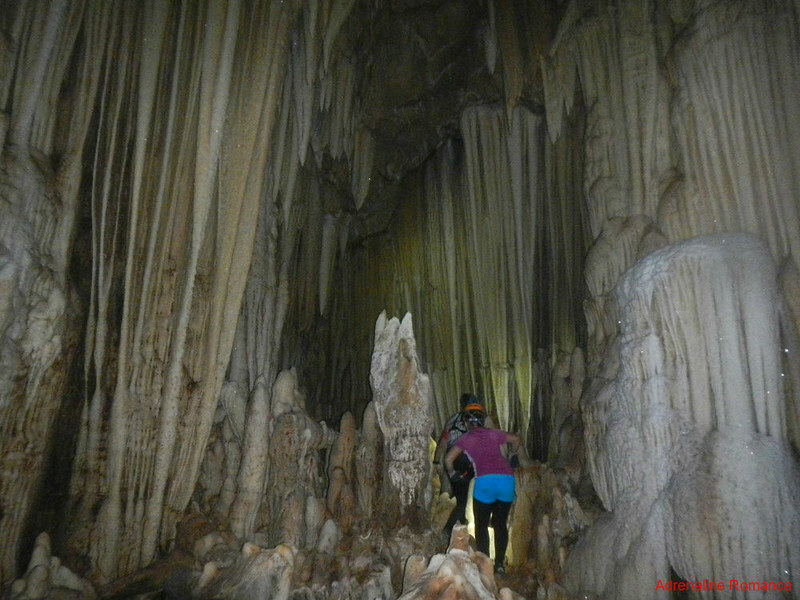 At 400 meters in length, Central Cave is not as large as other caves in Samar. But this is a cave of immense beauty, confirming the old adage that size doesn’t always matter. 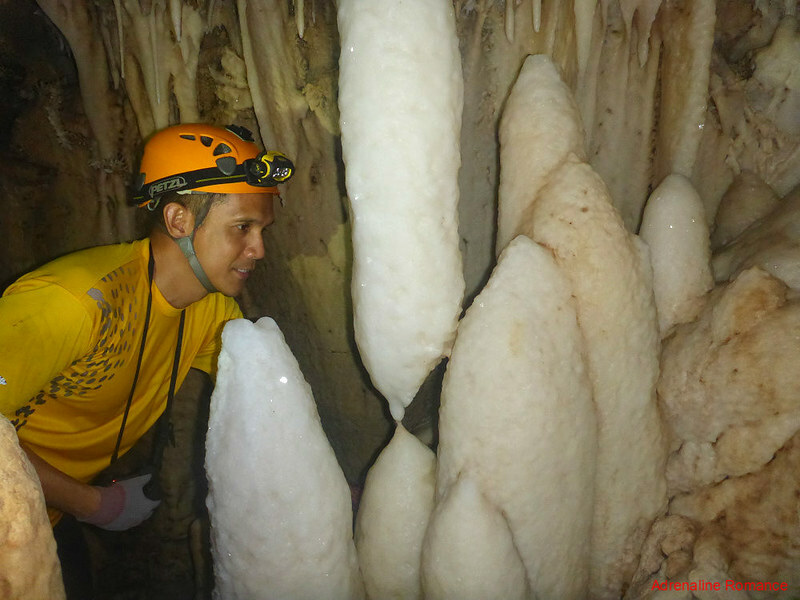 Following a rewarding and sumptuous dinner after our adrenaline-pumping adventure in Lobo Cave, Sir Joni explained that Central Cave requires a vertical entry and exit. That meant, we need to use single rope technique (SRT). As its name implies, SRT involves a series of methods used to descend and ascend using a single rope. If you remember, we used SRT during our vertical bivouac adventure in Bukidnon a year ago. 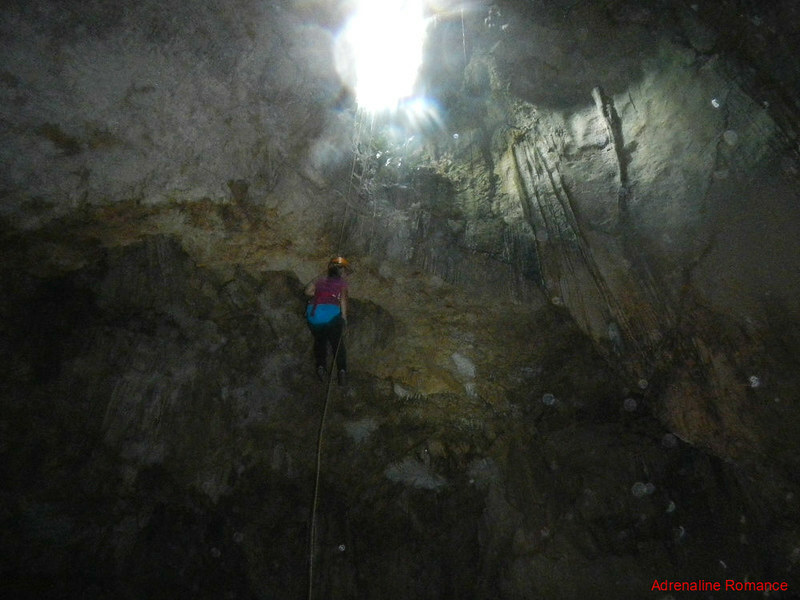 To safely enter and exit the cave, he taught the team how to use the Petzl Stop for rappelling down and the ascender for going up a rope. We did the short briefing the evening before the adventure so we could save time tomorrow during the actual adventure. Early the next morning, we woke up to a dark gray, rainy day. We were quite concerned about caving during a rainy day. What if the cavern gets flooded? What if there’s a landslide while we were inside? But Sir Joni assured us that it is totally safe. 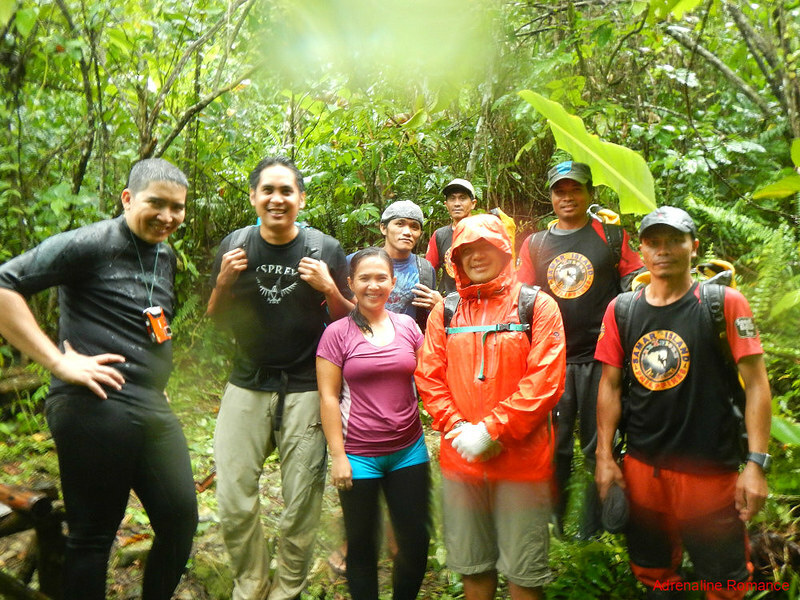 Normally, rainy weather is a bane when it comes to trekking in the outdoors. But this time, it was actually a boon; the rain was totally refreshing. 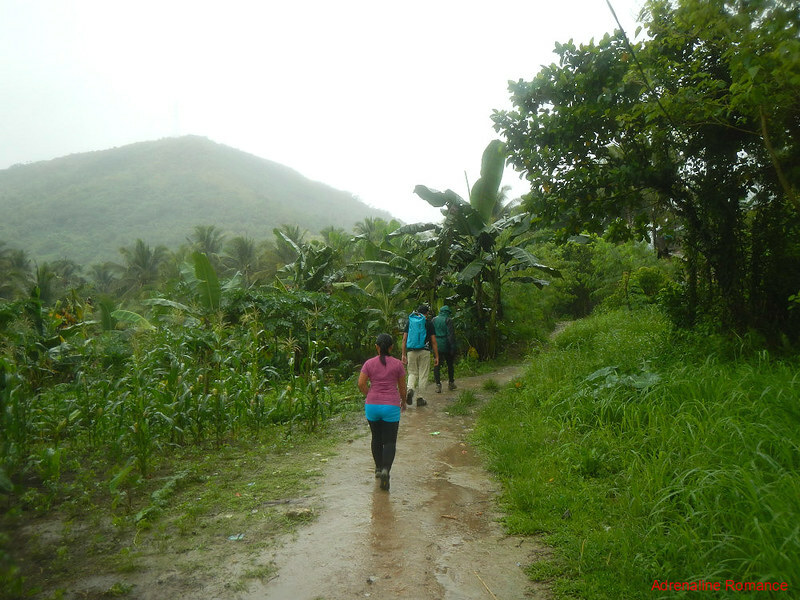 The hike to the entrance to Central Cave took three long hours on farmlands, riversides, and woodlands, thus walking in the rain meant that we were having a cool shower while walking. Walking on the trail in bright, hot sunshine would have been absolutely exhausting. 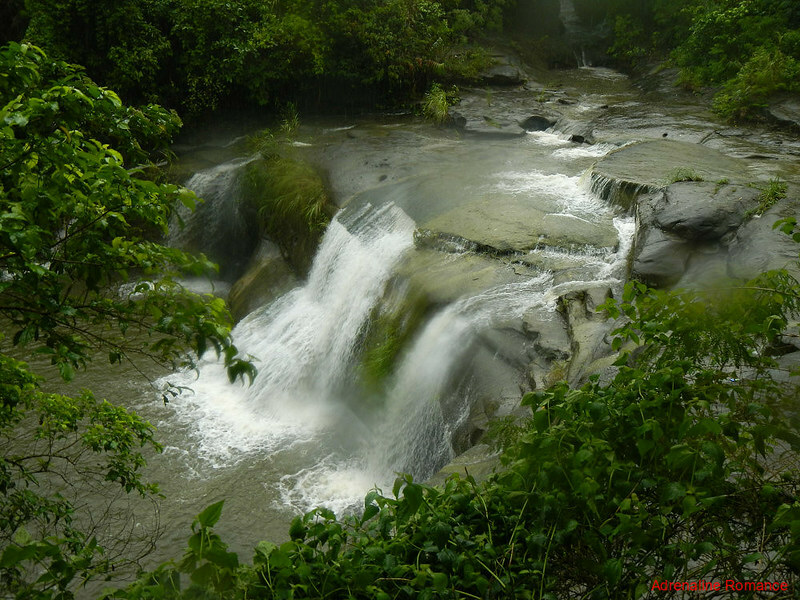 Nearing the Kulador Surface Water Treatment Plant in Barangay Manguihay, we came across Bangon Falls, one of Catbalogan’s most beautiful waterfalls. Although the photo below gives you a barely imperceptible idea of its size, that is actually a large waterfall. 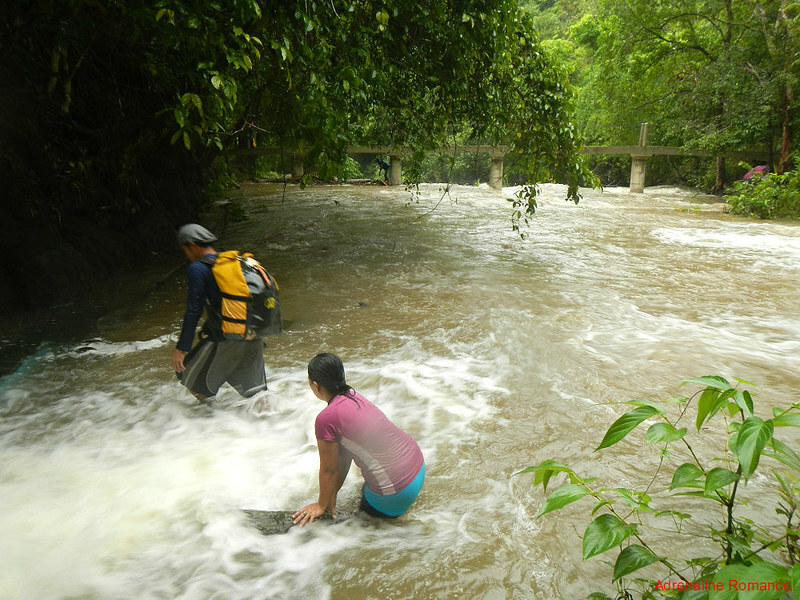 Bangon Falls is part of the route of Sir Joni’s Samar canyoning adventure. We will try out that adventure very soon. The first half of the trek involved walking on muddy dirt trails and balancing on huge water pipes that crisscross across the land. To continue on the second half, we had to ford a river with a very slippery rock bed. We were very cautious in crossing the waterway due to the presence of moderate rain. Any time, the serene river could turn into a raging flash flood. As a vast water source, this river is an important conduit in the lives of Catbalogan’s locals. 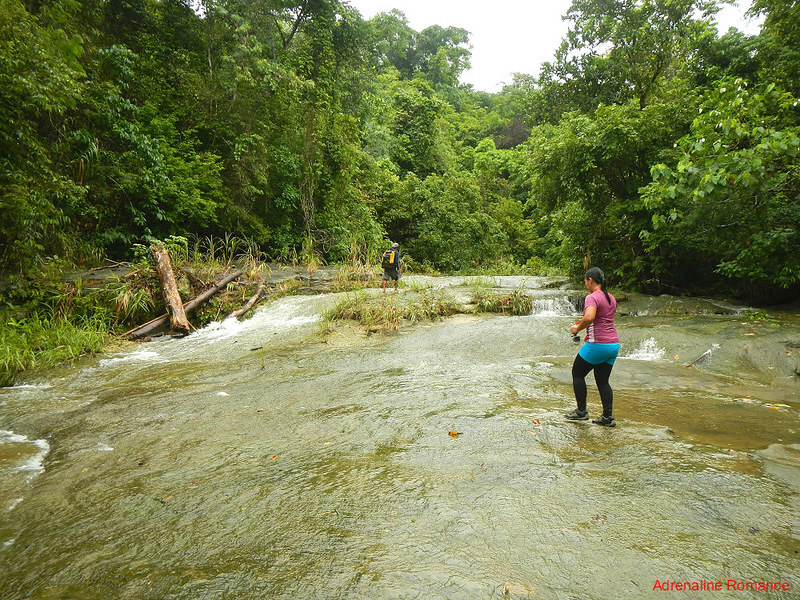 A few kilometers off the river, we went deep inside a wet, fertile jungle in Barangay Kawayan. 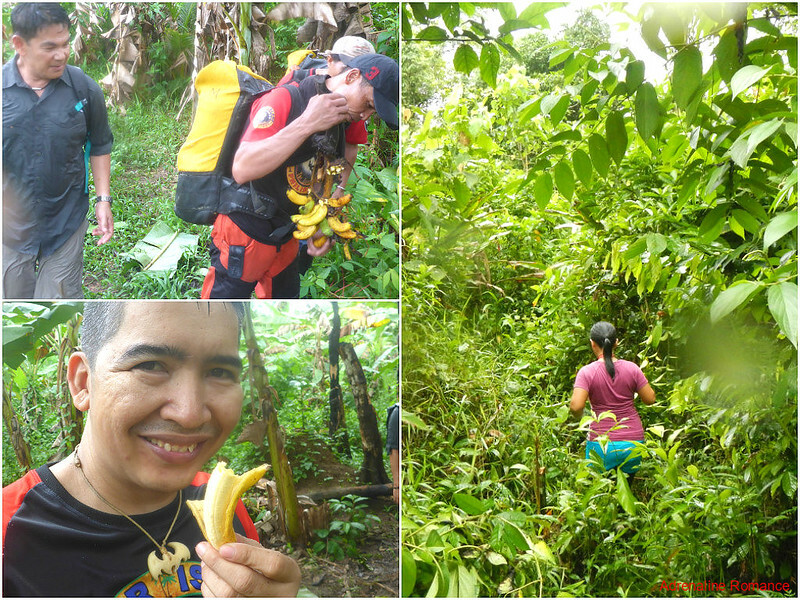 To replenish our energy, we ate wild bananas that grew along the trail. Wild bananas are slightly sweeter than their more common counterparts. Following a 40-minute, steep and slippery ascent, we finally arrived at a small man-made clearing adorned with rudimentary benches made of tree limbs. It took us two and a half hours of brisk walking from the jump-off point to reach our destination. We were heaving our lungs out, and our hot, wet bodies emitted steam. Feeling extremely hungry after the long and exhausting trek, the team decided to eat an early lunch before exploring the cave. In front of the clearing is the tiny, unremarkable entrance to Central Cave; technically, this is called a sinkhole. A sinkhole happens when a part of the surface collapses due to erosion, subsidence, or the lowering of the water table. 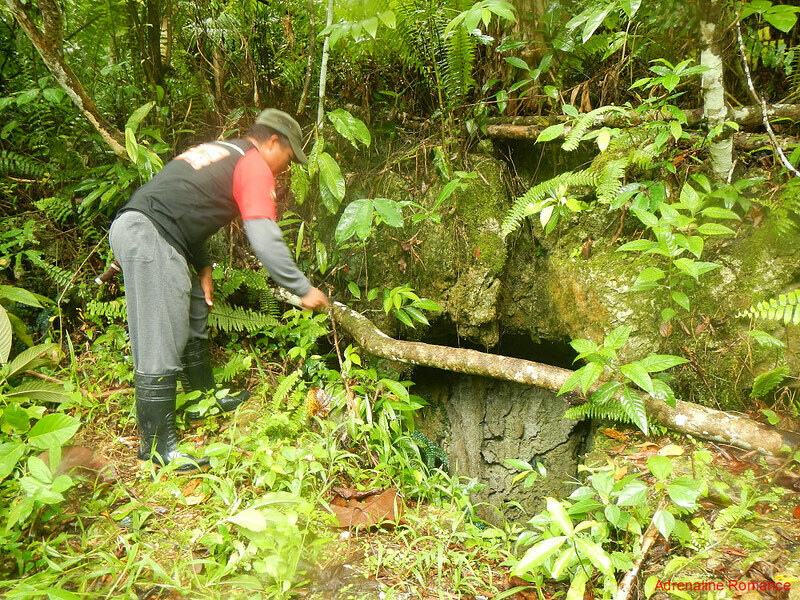 Sinkholes commonly occur in limestone karst formations like the mountain we are on. 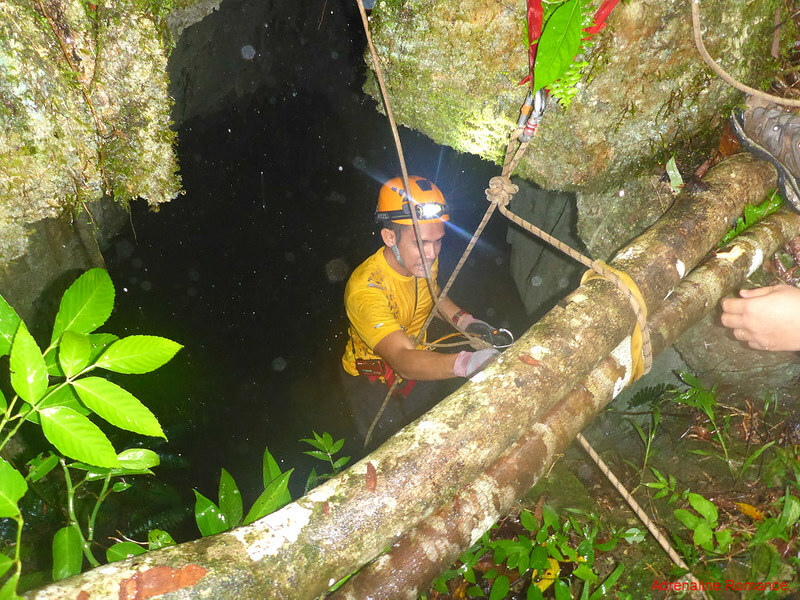 In the past, thick vegetation covered the entrance to this abyss. Can you imagine the danger this hole posed before the plants were cleared away? 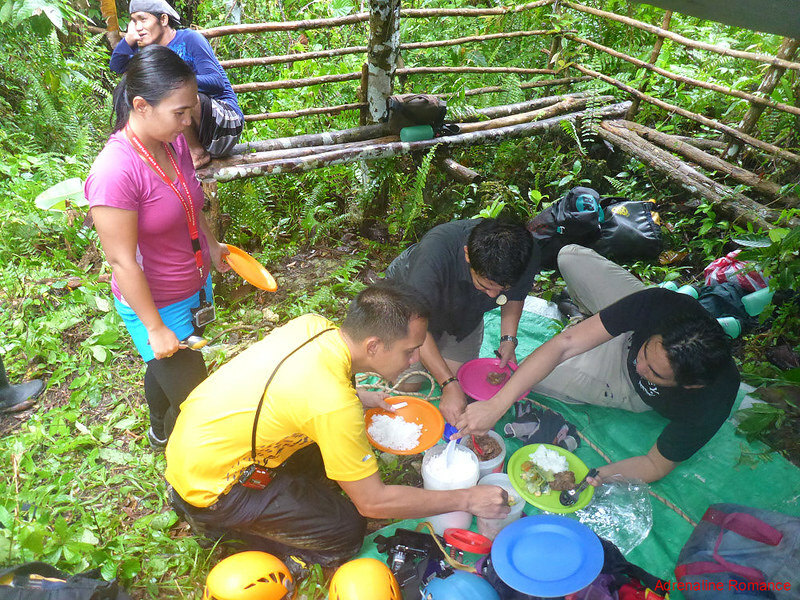 After enjoying two platefuls each of the delicious pork adobo and crunchy mixed vegetables, Sir Joni and the porters started setting up a rappel anchor so we can safely enter Central Cave. Redundant attachments were established to ensure a bombproof anchor. 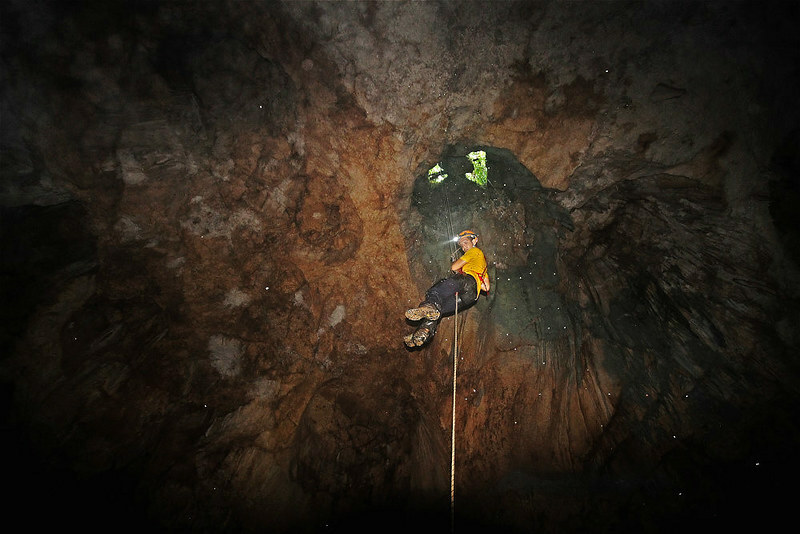 A second safety line was also set up; in case of equipment failure or if the caver loses control of the main line, the porters above can still catch the fall with the second line. Once the anchors were secured and double-checked, it was time to go and descend down the black void. 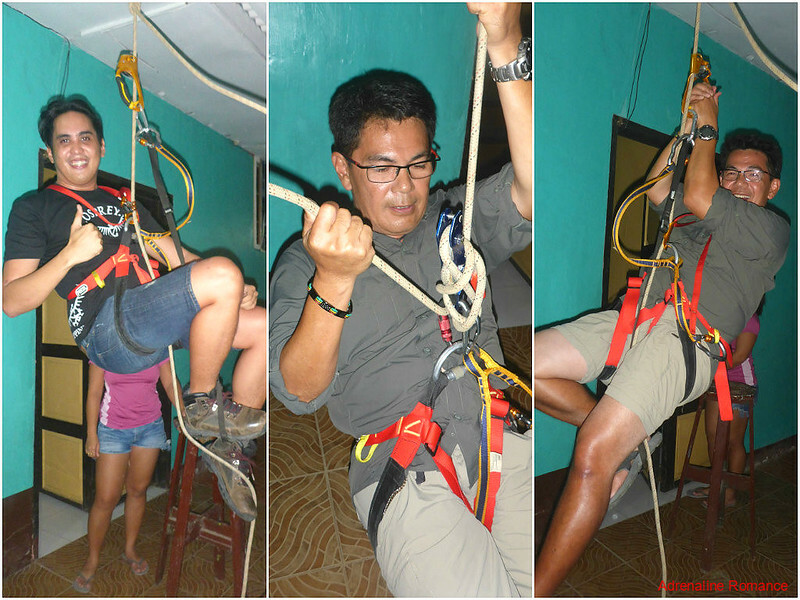 Sir Joni asked me to go first to demonstrate the descent and to assist the other team members from below. No matter how many times I abseil, I always feel a certain kind of thrill and anxiousness whenever I get ready for a descent. Call it—yes—the onset of an adrenaline rush. In a few moves that involved a little bit of yoga and squeezing in a tight space, I was suspended 60 feet with nothing but the empty air of the abyss below me. The feeling of hovering from such a deadly height is a weird combination of calm and excitement mixed with a bit of fear. After rechecking my Petzl stop and securing myself to the second line, I released the lock and rapidly descended to the bottom. With the assistance of Sir Joni, one by one, the other team members followed suite. Edgar was particularly thrilled; later, he said he felt as if he just did a Mission Impossible move! How cool is that! Sweetie rappelled down followed by Sir Joni. From this angle, you can see that the sinkhole and the cave’s main chamber resemble a short-necked bottle, with the sinkhole as the “mouth” of the bottle. 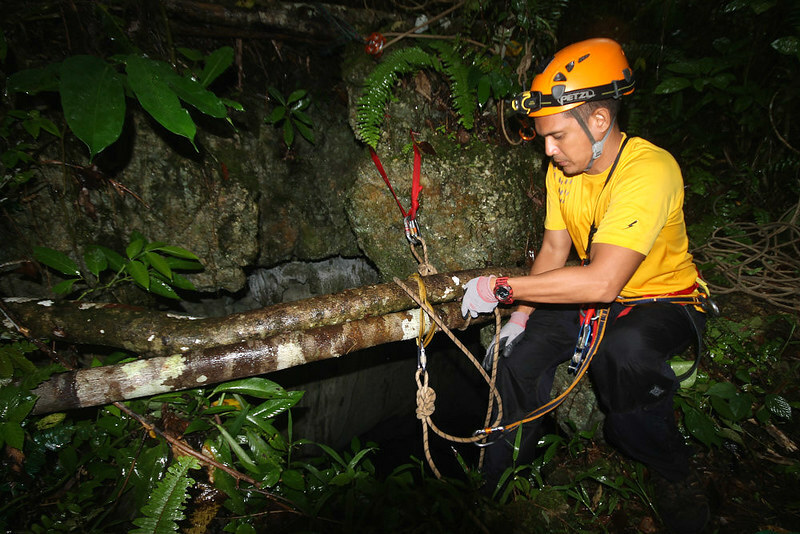 Without a line attached to a sturdy anchor above, escape from Central Cave is virtually impossible. In fact, a few years ago, Central Cave almost claimed the life of a young local porter who happened to be with us. 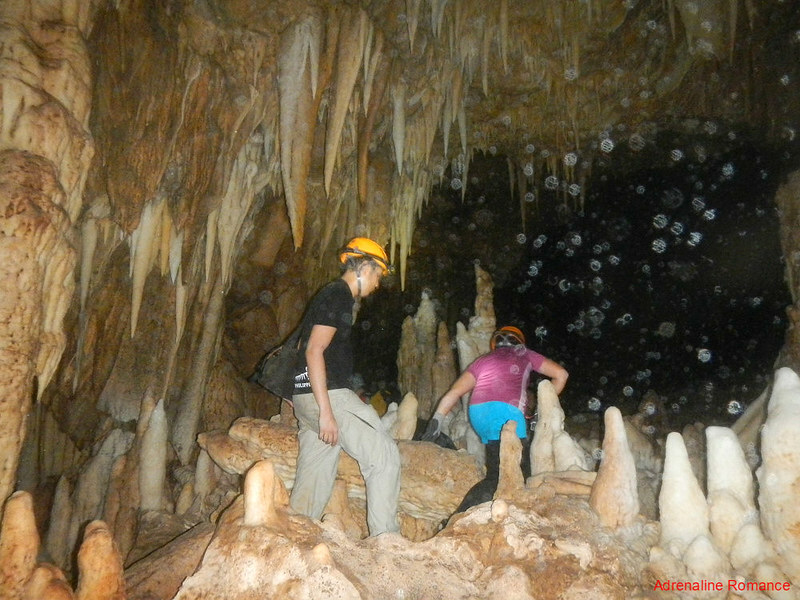 Hunting for bird’s nests, he and his friends went inside the cave using nothing but forest vines. The descent went well, but it was during the ascent that got him into trouble. Without any safety equipment, he couldn’t rest or take a break during the ascent. He had to hold on in the face of sheer exhaustion and screaming muscle pains. If he lets go of the rope, he will plummet to the sharp rocks below and perish. He was very, very fortunate to have escaped the cave alive. Once everyone safely reached the bottom, the adventure began in earnest. We carefully climbed down a hill of sharp, loose rocks—the remains of the ancient cave-in that formed the sinkhole. The wonders of Central Cave unraveled even as we touched down. Check out the ground where Sweetie is squatting. 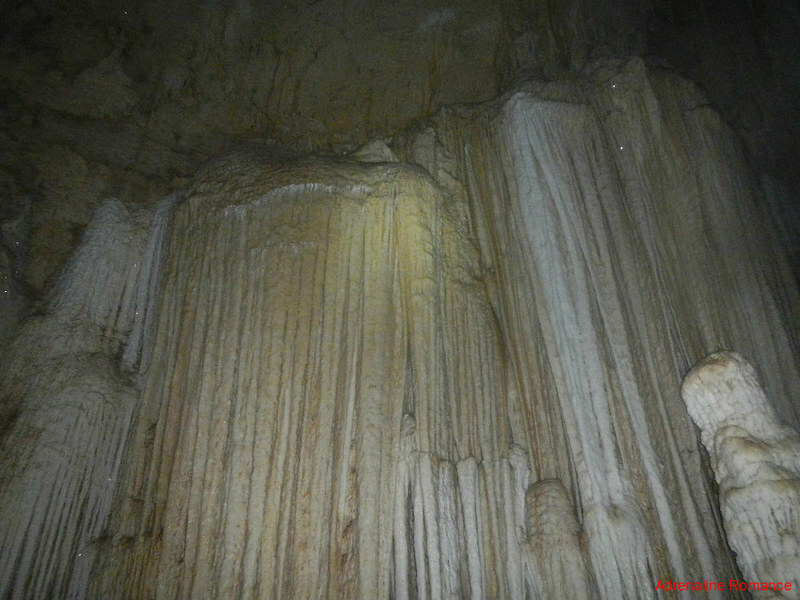 The white, chunky substance are actually young speleothems, formed by the interaction of calcium carbonate and rainwater which falls from the sinkhole. 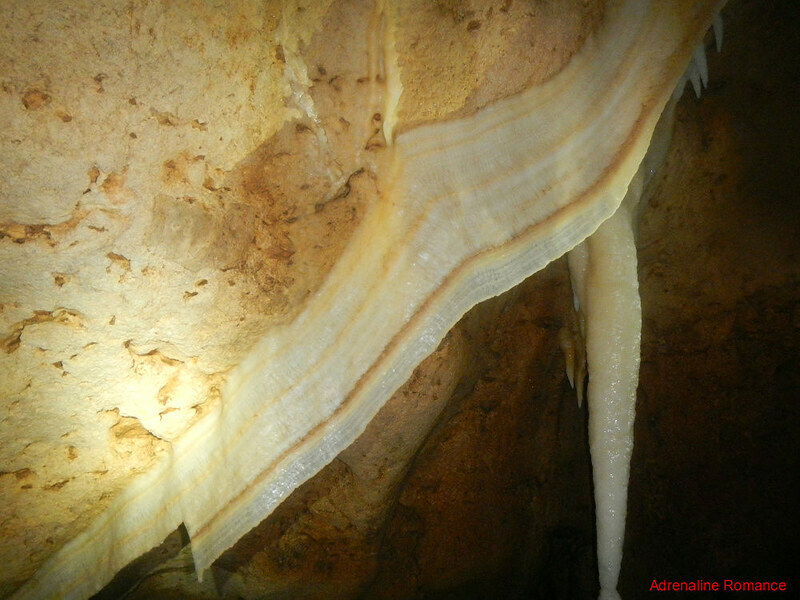 Another thing that didn’t escape our attention was this huge hanging flowstone. Yes, the formation is impressive enough, but what is striking about it are those white branch-like things that are stuck to its surface. 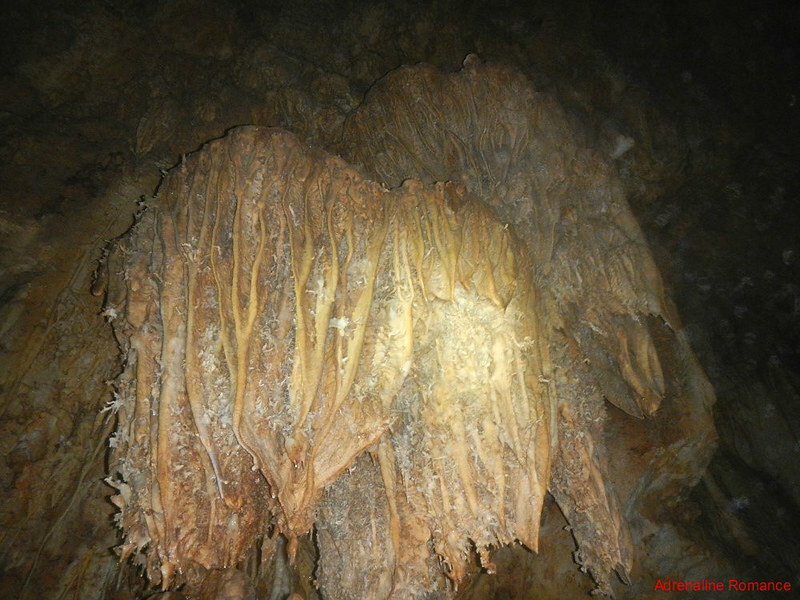 Those are helictites, speleothems whose axis are altered sometime during its growth. They look like tiny ribbons, rods, saws, fishtails, and other forms that seemingly defy gravity. Scientists are actually baffled as to how they are formed. They are among the most fragile types of cave formations, and extreme care must be taken not to brush against them. 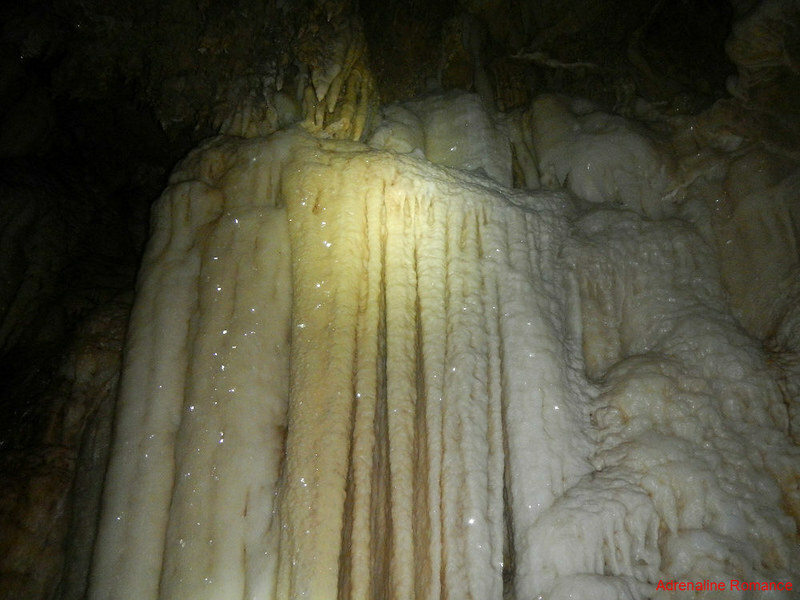 This small section of the cave’s wall is filled with innumerable crystal formations. Just check out the photo below. They look like the intricate wall of some Gothic church in Europe! We stepped into a vast, secret, silent kingdom of sparkling crystals! 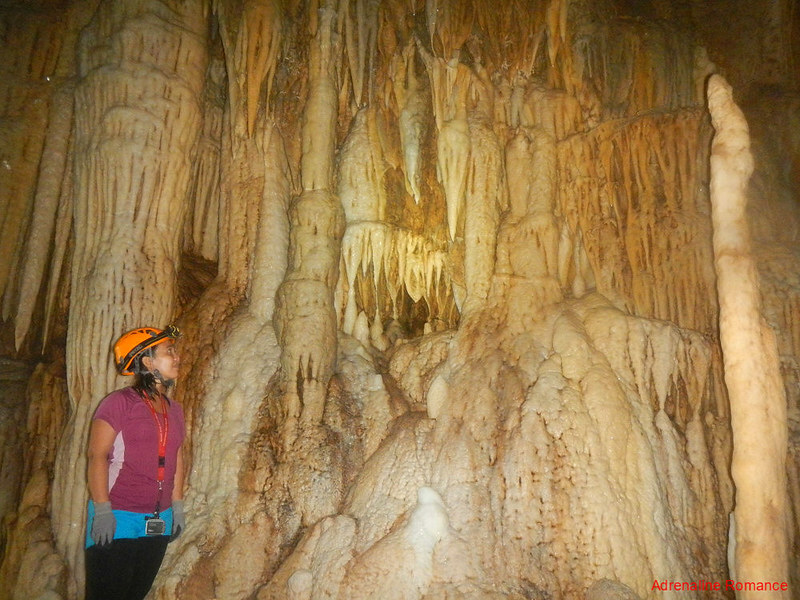 Just take a look at all those stalactites, stalagmites, and other rock formations! Only very few human eyes have seen the heart of Central Cave. We were actually very lucky and privileged to have stepped into this dark realm. 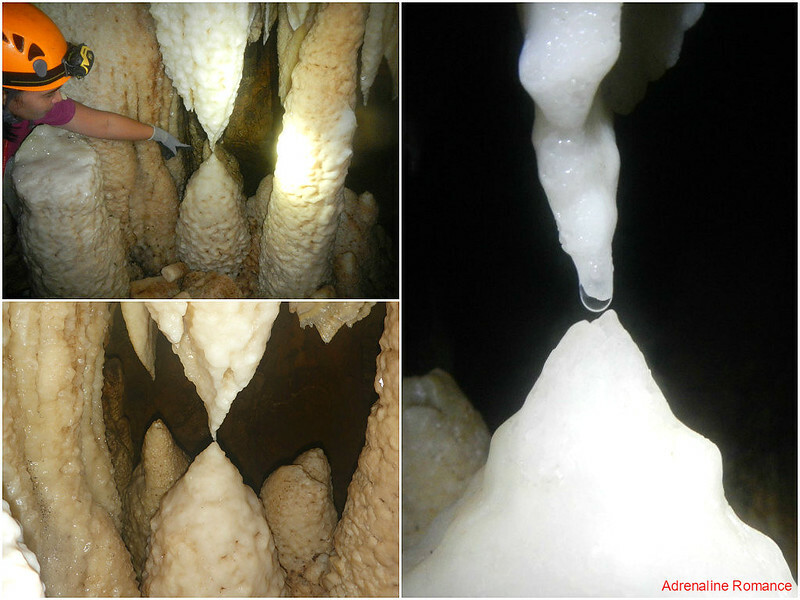 Covered with fresh calcium carbonate with embedded gypsum crystals, these stalagmites appear like rock formations covered in snow. Our jaws dropped in amazement when we saw these giant columns that easily soar up to 30 feet high. They look like covered with sweet, white meringue or cake icing. But no, those are newly formed flowstones made of calcium carbonate. Is that the cavernous mouth of a Lovecraftian monster whose breath smells like a thousand rotting corpses? 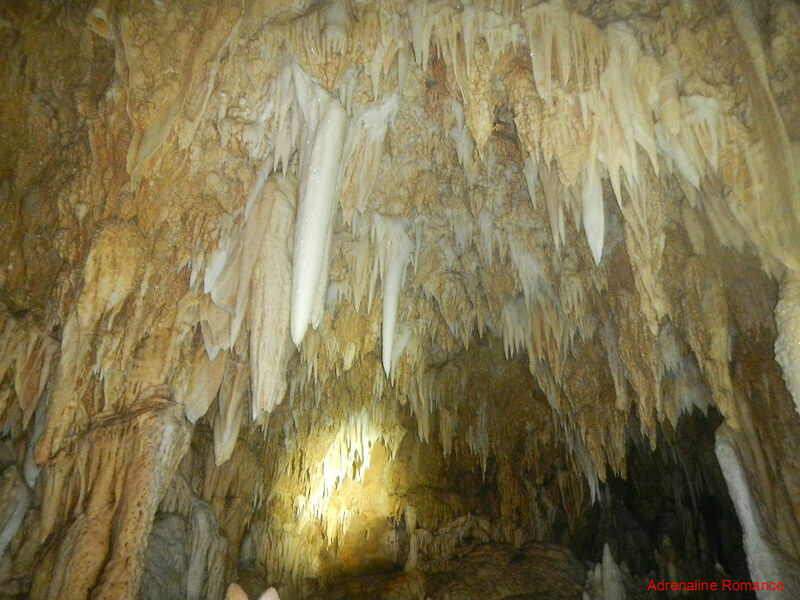 No, that’s just a small passageway surrounded by teeth-like stalactites and stalagmites bordered by gum-like flowstones. Also, check out that large pillar in the foreground. Sir Joni led us to an actual geological process in the making. On the way, we were stunned about just how beautiful and pure the rock formations are. It was apparent that this cave is quite young (in geological standards, of course). Let’s take a closer look. There was a crystalline column in the making! That drop of water is loaded with microscopic mineral deposits. 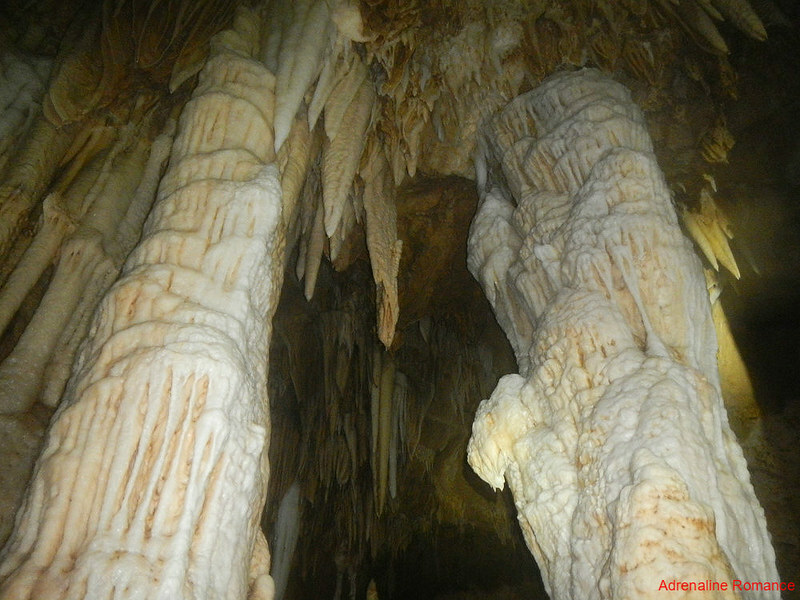 In time, it will accumulate enough deposits so that the point of that stalactite will connect with the top of that stalagmite. When that happens, the formation becomes a column. When we got there, that tiny drop stubbornly refused to release its hold on the stalactite as if frozen in time. Gravity will eventually win, but it will probably take more moisture for the drop to finally fall. 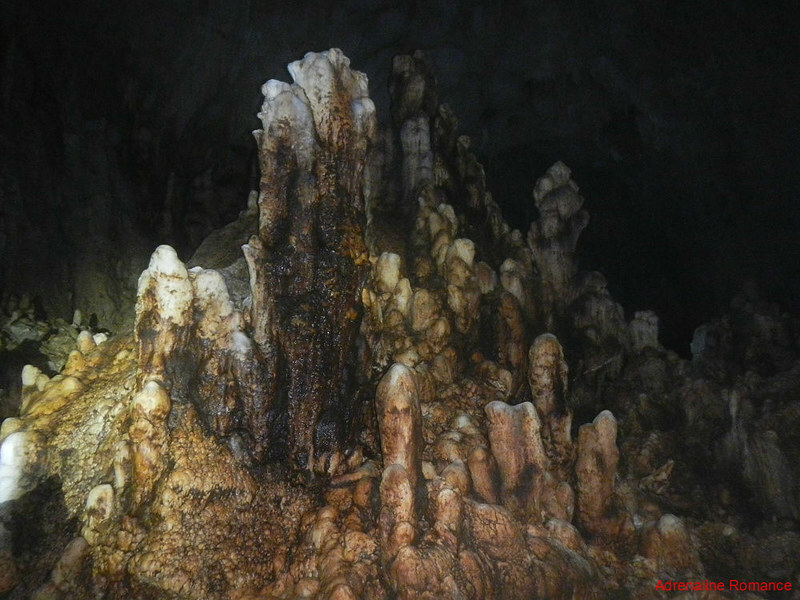 It is quite fortunate that Central Cave is inaccessible by conventional means. Its inaccessibility proves to be the major factor in keeping this fascinating natural treasure carefully preserved. 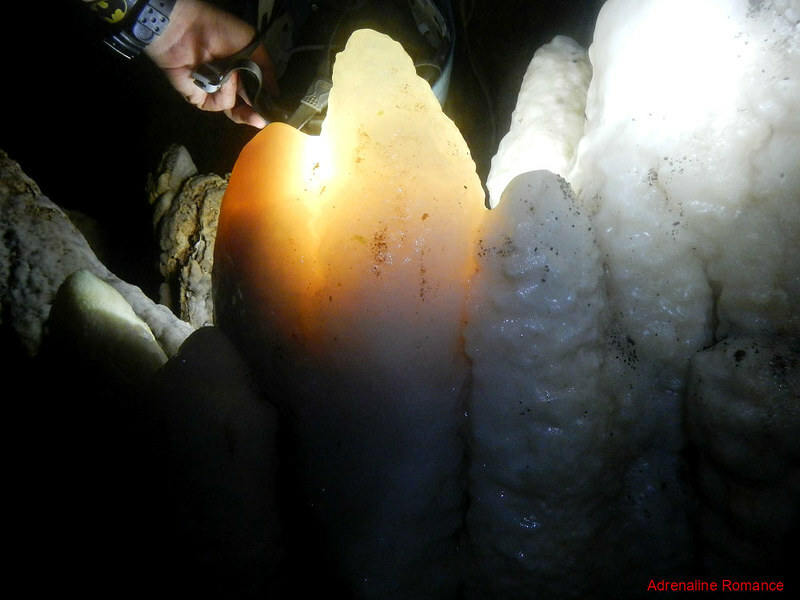 Just to show you how pure these calcareous formations are, we shone a light behind it. The translucence of the crystal actually makes it glow! 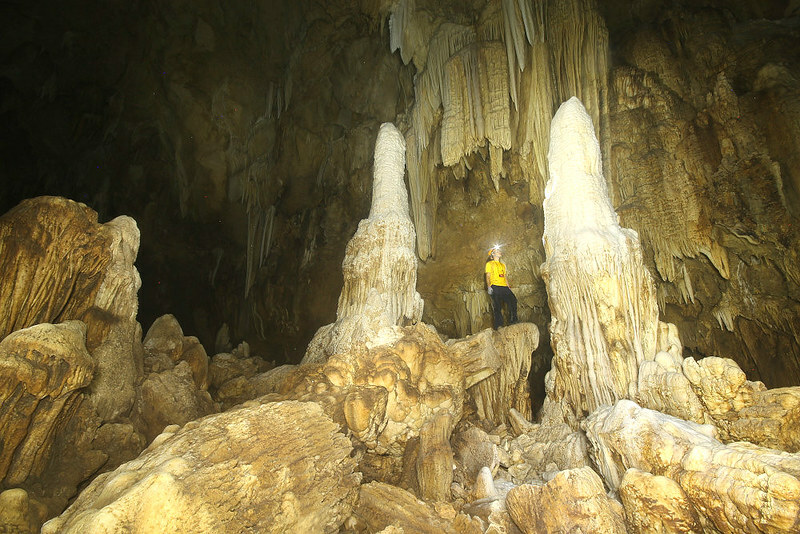 The immaculate state of Central Cave is truly something to be astonished about. 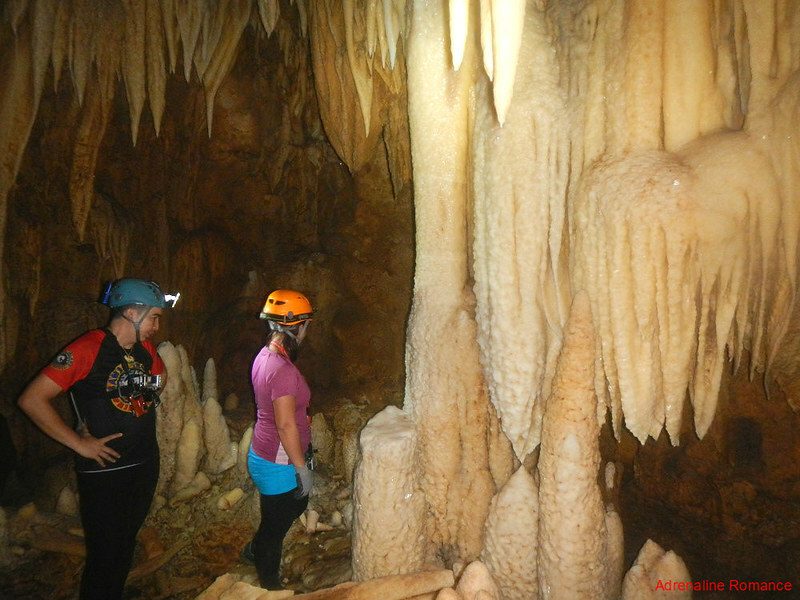 Overhead, we saw numerous giant sharp calcareous stalactites, each one taller than a human being of average height. Can you imagine if one of that falls directly on a person? He or she will surely be skewered like a kebab! 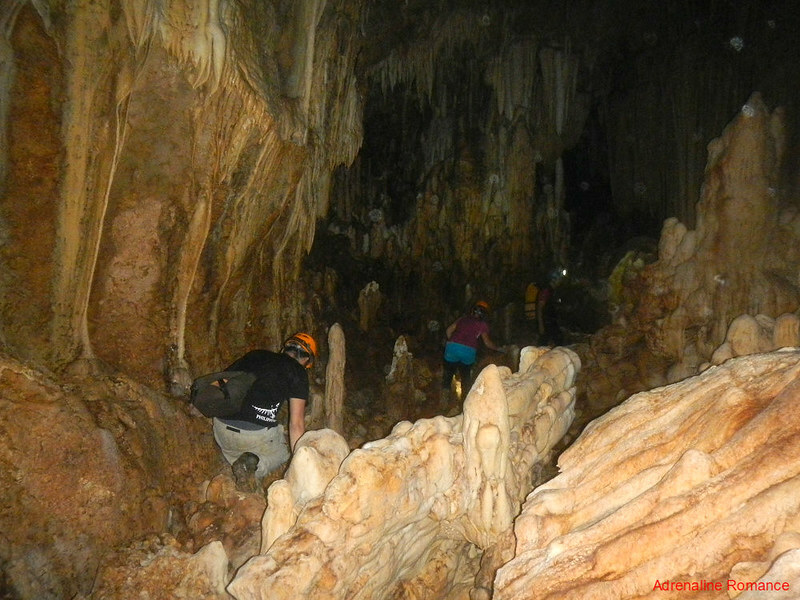 While moving around Central Cave, we had to be very careful where we step or what we hold. Indeed, what kept our movement constrained, slow, and difficult was that we were unwilling or hesitant to touch or step on anything! In this delicate and enchanting place, the slightest touch or the lightest brush can irrevocably destroy these exquisite rock formations, which took thousands or even millions of years to form. We had to take time to find solid rock or dead crystals which we can hold or step on. Whooops! Be careful! We had to crouch low to avoid hitting that extremely thin formation sticking on the wall. That is called a bacon, and it’s a type of speleothem called a drapery. We also had to take extra care not to hit that newly formed translucent column as we move around. A bacon is a slender drapery that is adorned with colored bands within the sheet. That is just how skillful an artist Mother Nature is. This particular bacon is so thin and translucent that we can see the light from our headlamps from the other side! Nothing lasts forever, even timeless crystalline stalagmites that have been left undisturbed for eons. 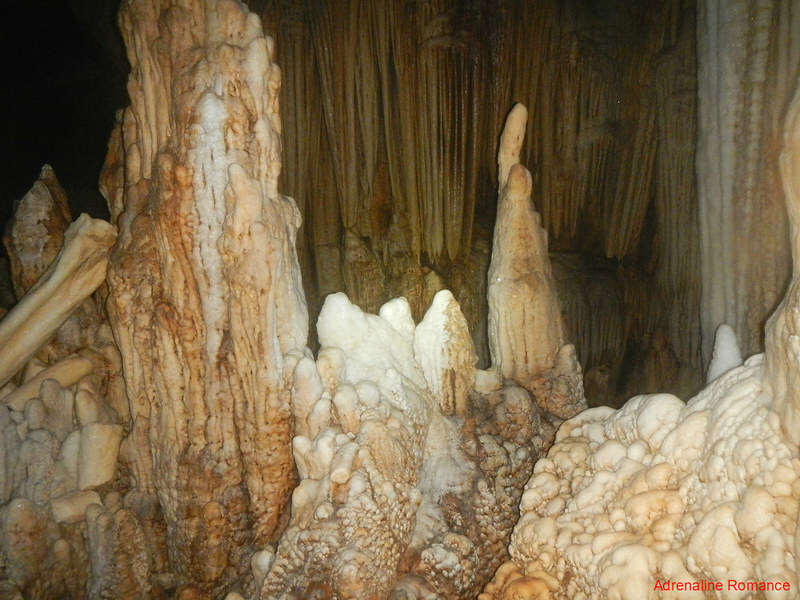 The dark brown sections of these stalagmites are once calcareous structures that have withered in time. Rather than soft calcite deposits, they have become hard rock. Touching fresh calcareous formations shortens their lifestyle. That’s because oil from our skin sticks to the surface, preventing moisture from saturating the area (oil and water don’t mix, remember?). Without moisture plus the additional attack of our skin oil’s acids, the formation dies. 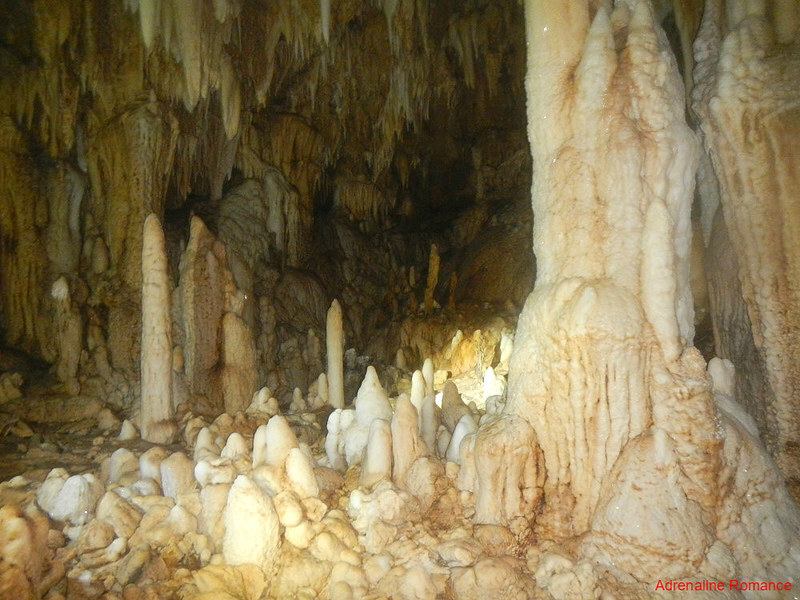 Another amazing attraction inside Central Cave is the Twin Stalagmites. These are massive 25-foot crystalline stalagmites that seemingly forms a gate to nowhere. Perhaps it definitely is a gate to some other ghostly realm as standing between them generates a feeling of awe and reverence. Central Cave forms a massive circular dome with a long tail, roughly resembling a tadpole. After taking photos of the Twin Stalagmites, it was time to explore the length of the tadpole’s tail. We came to an area where we were surrounded by massive, white flowstone curtains! It’s like being in a forest of crystals. Aren’t they beautiful? Is that an expansive frozen waterfall? No, that’s an entire wall of speleothem formations. 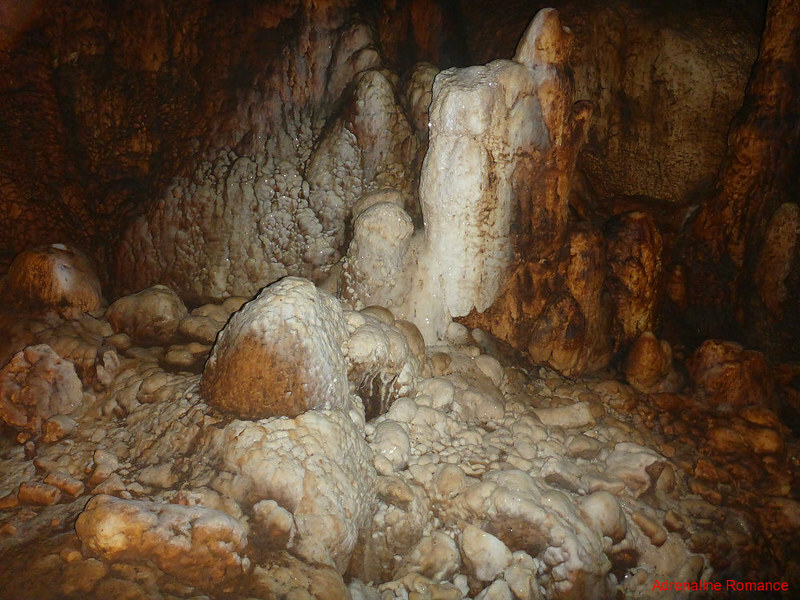 Many stalagmites, although small compared to the Twin Stalagmites, are actually significant in size. Sweetie stood between two of the larger ones. They are actually taller than her. 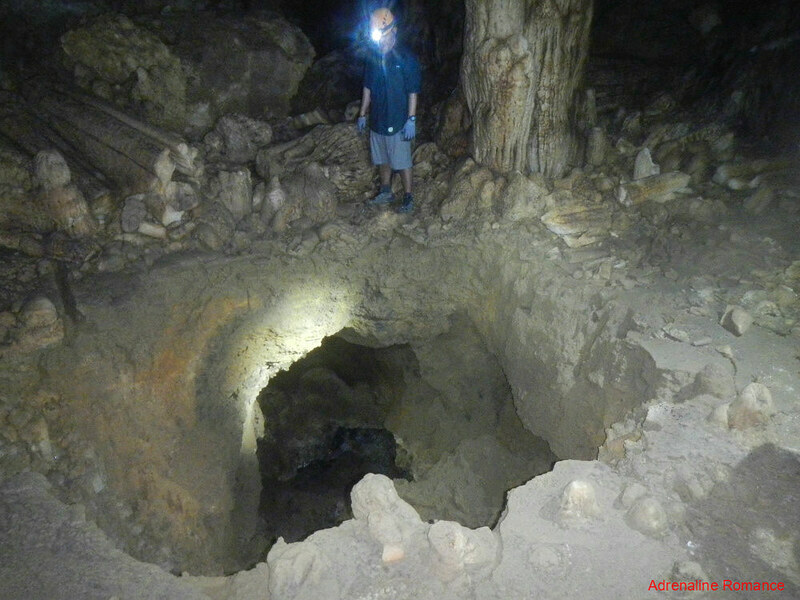 This dark sinkhole was a recent addition to Central Cave; the ground gave way after some natural geological event. The sinkhole opened up to a new lower branch, which hasn’t been fully explored and documented. Be careful and watch your step! The ground around the hole is loose and quite soft. 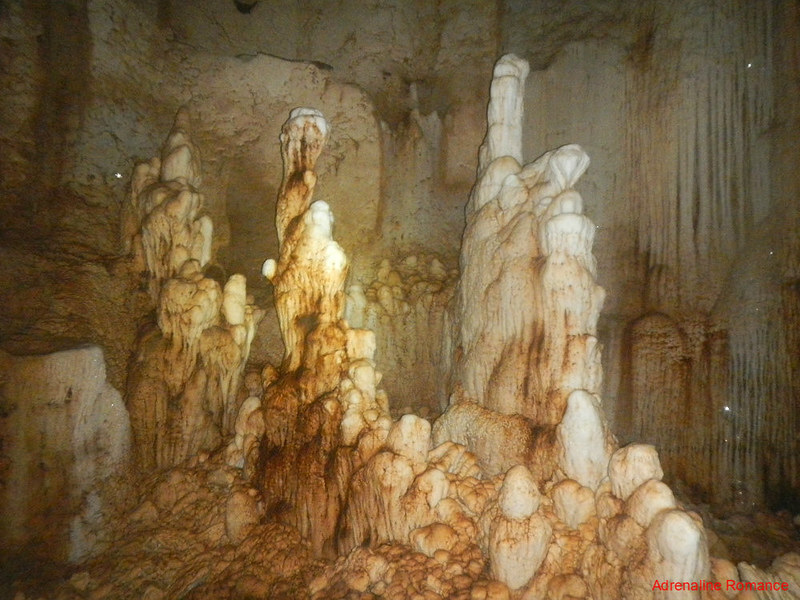 These naturally dying stalagmites vaguely resemble a multi-towered fortress. Looking at them, I suddenly remembered a good friend who drew such ominous structures when we played Dungeons and Dragons during our younger years. How come there’s a fast-flowing whitewater stream here when this is supposed to be a dry cave? Well, that’s not a stream. Those sinewy waves are actually—yes, you guessed it—crystals that form delicate whitecaps. Simply stunning! Technically, this type of formation is called a shallow-gradient rimstone dam. More stalagmites! It seemed that the farther we went, the taller these stalagmites became. Mother Nature is supposed to be random. The Wyld and Chaos at its purest, so to speak. 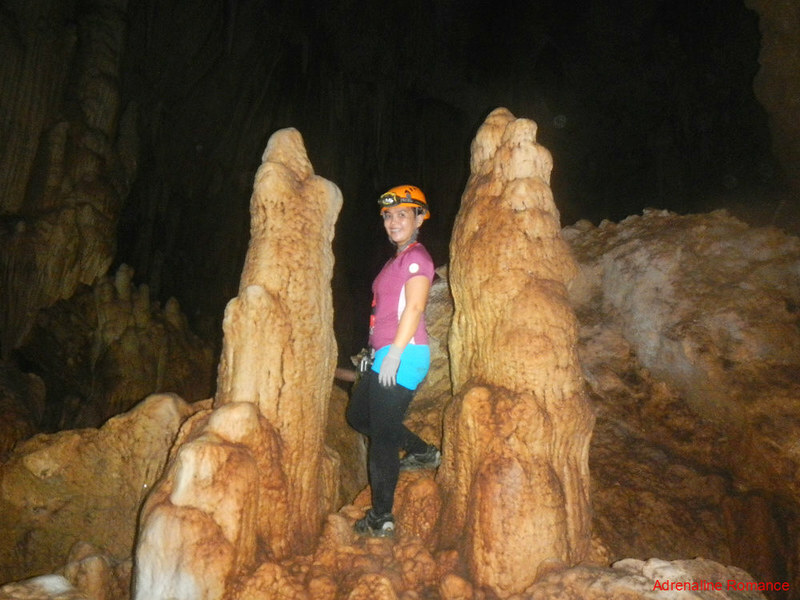 But three very identical stalagmites seem to defy her rules! 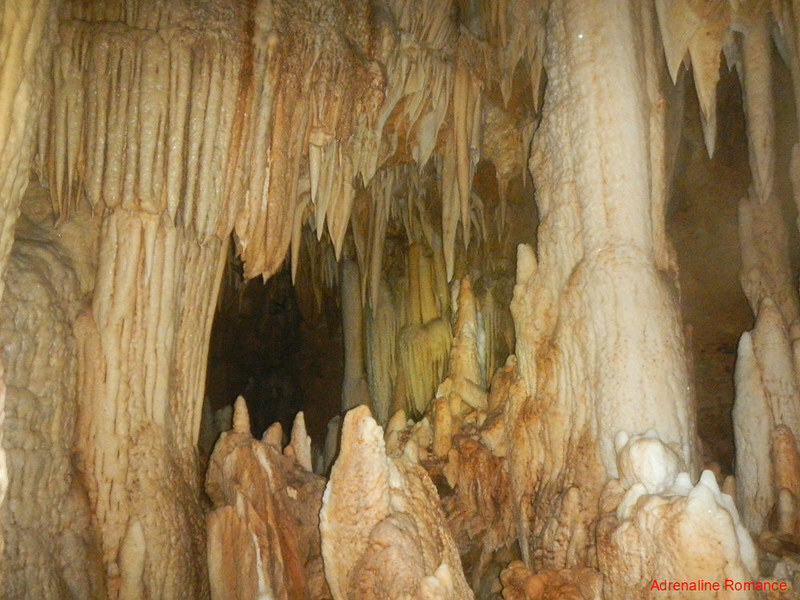 There was seemingly no end to the wonderful crystal formations that we encountered here. Hopefully, these rare gems of Mother Nature will be preserved for all time. 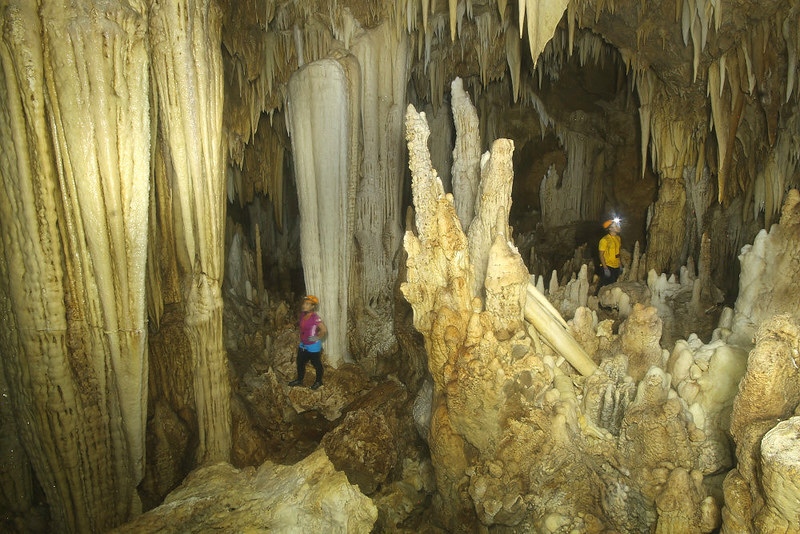 Hopefully, visitors in Central Cave will take extra care not to damage or destroy them. In one corner of another room, we saw this community of still-growing stalagmites. They look like tall, snow-covered mounds. Everything around us in this magnificent cave system is alive—growing, changing, and dying in its own strange and complex ways. 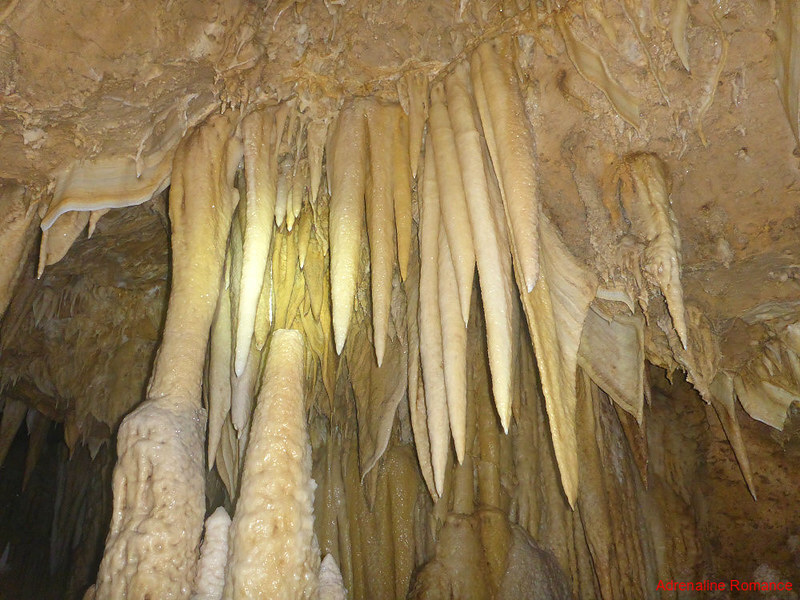 Those sharp stalactites overhead look like the teeth of a monstrous kraken! Now you know why helmets are mandatory here. Those stalactites can come crashing to the ground anytime without warning. Can you imagine if one hits you? After more than four hours of exploring the wondrous Central Cave, it was time to go back. We climbed a central “hill” made of the rocky remains of an ancient cave-in. See that faint light coming from the ceiling? That’s our ticket out, which is the sinkhole we came in. Using an ascender-and-croll setup, we slowly inched our way up the static rope that serves as our lifeline. Push up, step down, push up, step down. Ascending was quite laborious, and most of us stopped halfway during the ascent, catching our breath and giving our aching biceps a break. Making the ascent annoying—yes, that’s the right word—is the fact that it was raining hard up there in the jungle. The icy cold raindrops kept falling on our faces as we went up the rope. I, particularly, had a hard and painful time. I wasn’t able to adjust my harness properly, thus the leg wrap squashed something—well—quite precious in every male. 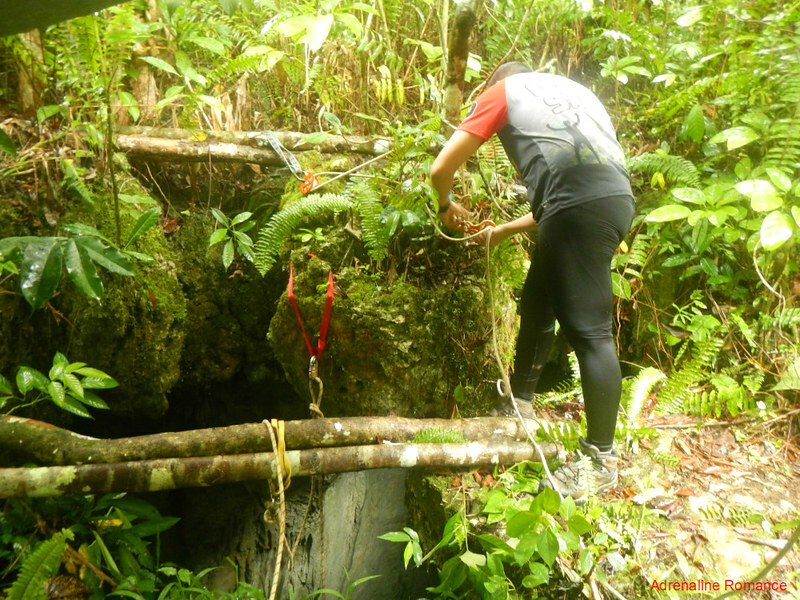 One by one, we safely made it out of the sinkhole and reunited with our porters. Of course, we were all smiling broadly; the adrenaline rush and the thrill stayed with us! Goodbye, Central Cave. The beauty and majesty of your glittering chambers were beyond anything we have ever imagined. 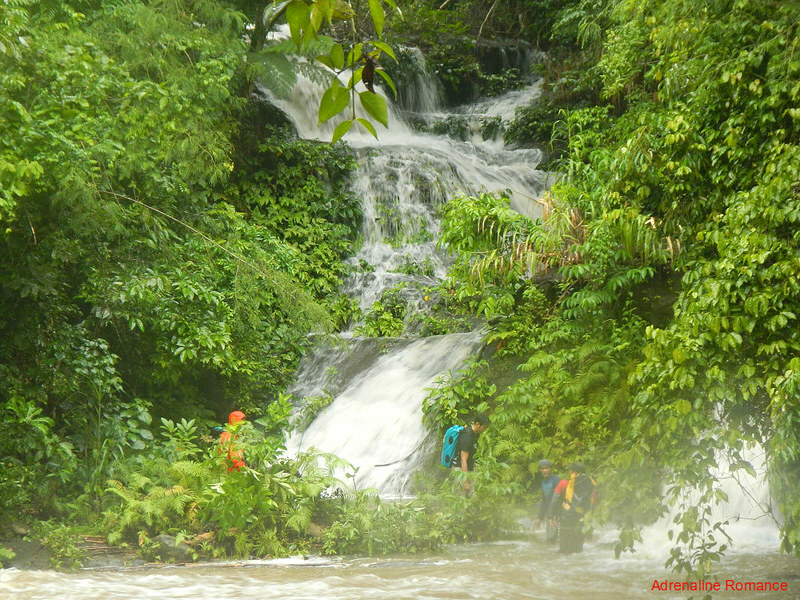 As we went down the jungle-covered mountain, the rain picked up pace until it became a never-ending torrent. 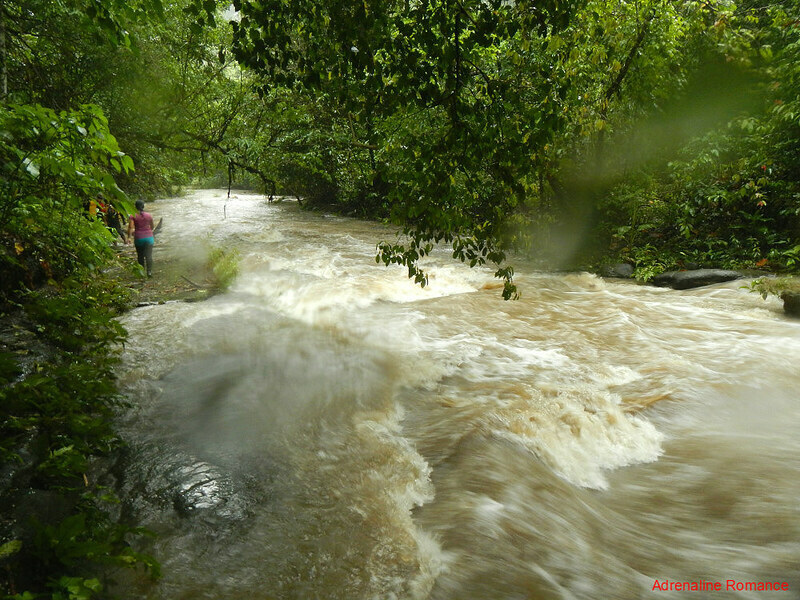 When we reached the river, we were alarmed that it has become a churning, raging monster—a deadly flash flood! Check out how strong the water was in the photo below. We wouldn’t be able to survive that immeasurably strong current if we’re swept there. We stuck to the edge of the slippery riverbank, holding on to strong roots and solid crevices to avoid being washed away. It is said that when you are one step away from your destination, that is when the ground usually falls under your feet. In our situation, this could be more right than we knew. To reach safety and the main trail that will take us back to civilization, we had to cross a small tributary that connects to the river. This was the only place where the current was weak enough so that we can use our physical power to counter it. We needed to tread very carefully and slowly here. One wrong move, one slip and we could be carried away to the deadly roiling waters of the main river. The tributary where we crossed is actually at the base of a powerful waterfall. Can you just imagine the danger we faced? But thank Mother Nature, we were all able to make it to safety. 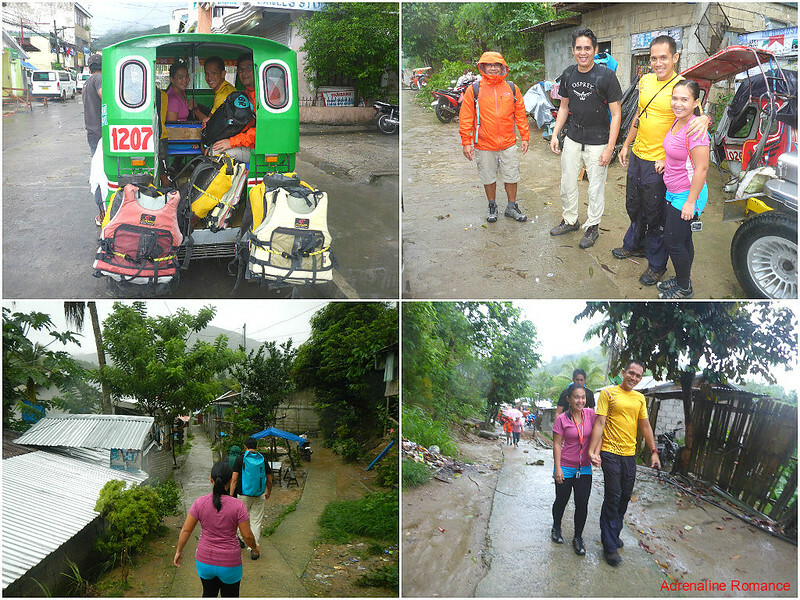 After a short rest, we started the final leg of our adventure, which involved a wet but easy two hour trek back to Barangay Andres where we could get a tricycle ride back home. Because we were on high ground, we were able to observe the immense power of the river in safety. 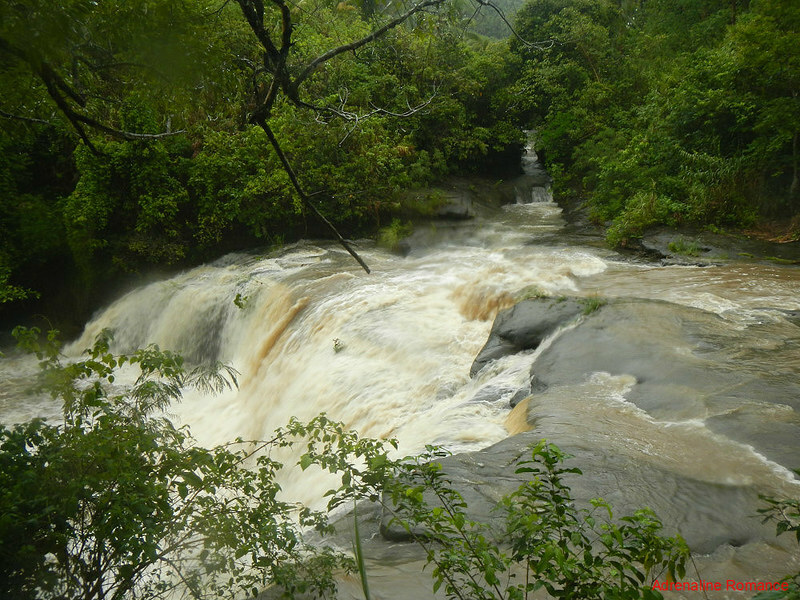 That’s the Bangon Falls, which has roared loudly as water from the river came crashing down mercilessly. Earlier, during our way up to Central Cave, this was a relatively calm and beautiful waterfall. 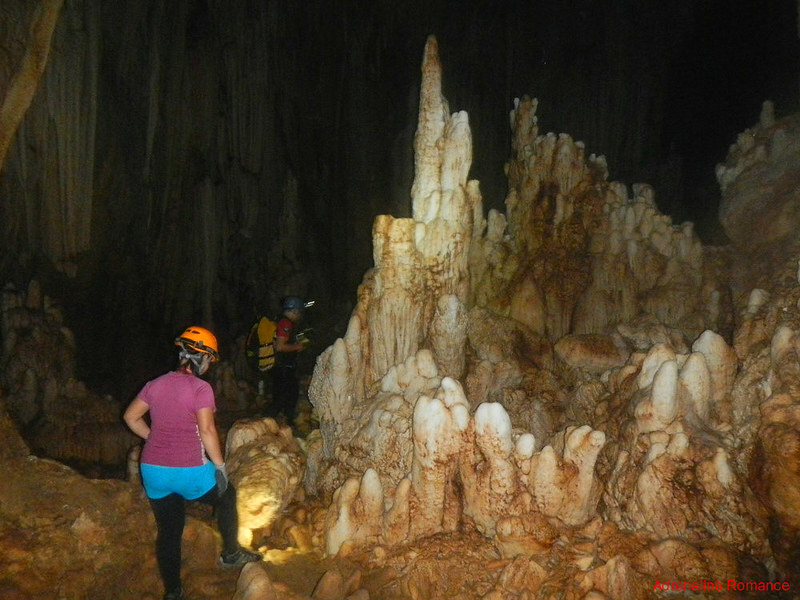 Our adventure inside Central Cave was nothing short of mesmerizing. But “mesmerizing” is not enough to describe the amazing artistry and elegance of the natural wonders inside that dark and quiet kingdom. Going inside this sparkling crystal forest is not just an adventure. It’s a trip inside Earth’s memories and secrets. * Rates are subject to change without prior notice. A down payment of 50% is required to confirm your booking (reservation fee is non-refundable nor transferable). Cancellation due to an unforeseen situation does not entitle you to a full refund. However, you have the option to reschedule your adventure at no added charges. Considering the technical requirements needed for safety and for negotiating the caverns of Central Cave, the rate is actually a very good deal. You will be equipped with top-quality equipment from Europe. You will be under the care of a highly trained cave master. Finally, there is a ton of inclusions that add value to your money. This unique experience has more value than a mere few thousand pesos. 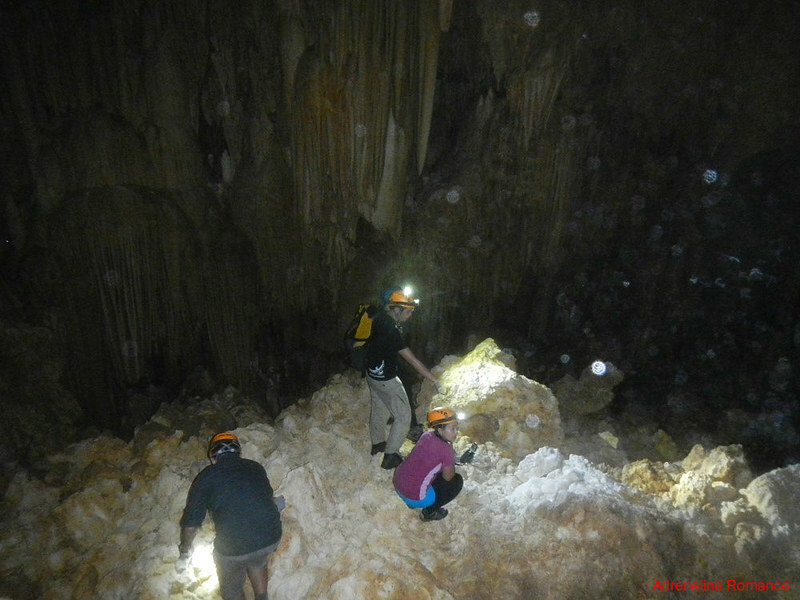 A minimum of 2 persons is required to organize and commence the caving adventure. Anyone from 8 years old and above can do this adventure as long as they are reasonably healthy. For safety, the number of participants is limited to 10 per day. 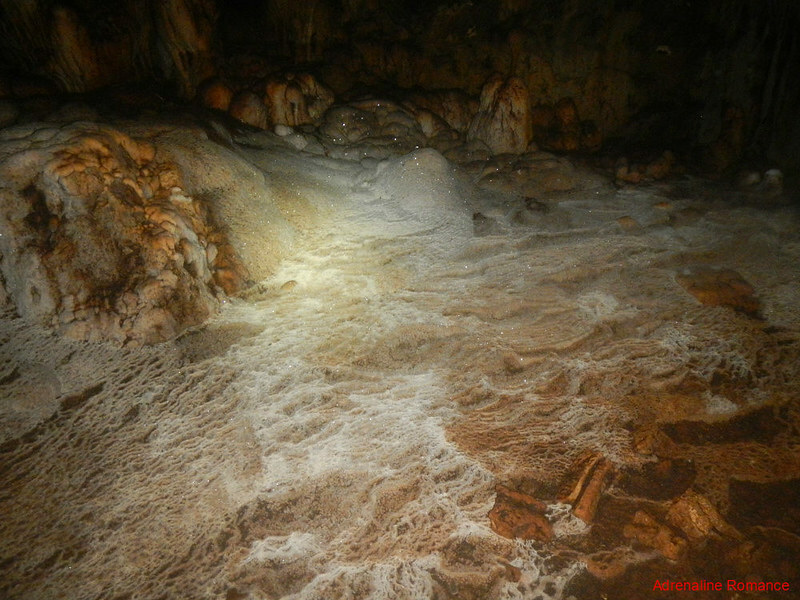 Caving is open all year round except during heavy or stormy weather. 2. In Catbalogan City, there are several inns and hotels where you can stay for the night. However, Sir Joni also has guest rooms right in his home. Check out the rates. The photos here don’t do justice. The rock formations are just magical! You should visit here sometime. Please do if you have the chance. Central Cave is spectacular! Sir Joni is an awesome, awesome cave master. His coordination with the local guides and porters is perfect. In fact, all the guests have to do is to have fun all the way! If we recall correctly, Sir Joni has a caving trip on October. Perhaps you may want to join him and his team. That’s one hell of an adventure, “Dynamic Duo”! That should be called The Central Of Crytals. But, I agree, that you’ve titled it perfectly. I wouldn’t mind going through all those obstacles if that kind of beauty is the price. The place and the photos are worthy of national geographic. Astig yung helictates. It looks edible. Hehe! Actually, we were supposed to make the title “A Kingdom of Crystals.” Hehehe! 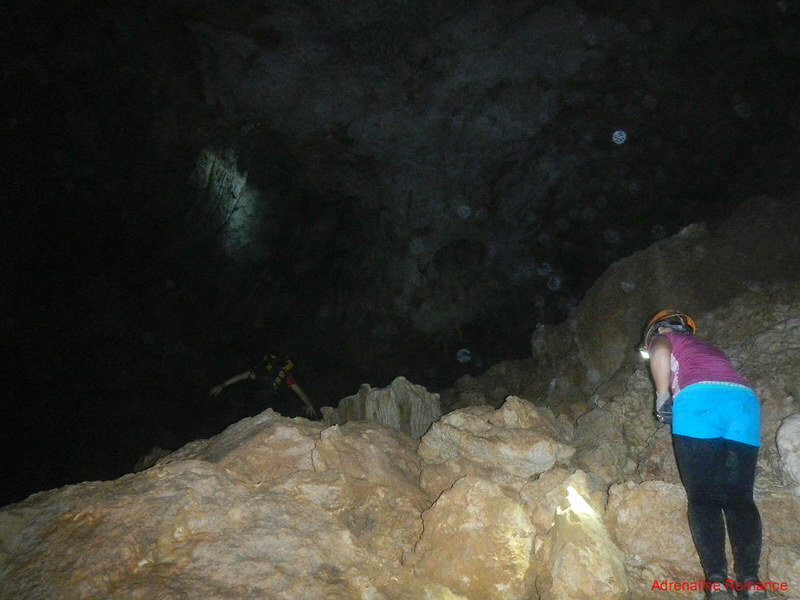 Scream, another amazing caving experienced. All the struggles that you guys had was entirely worth it. I see an extraordinary nature’s piece that God had made. Oh yes! 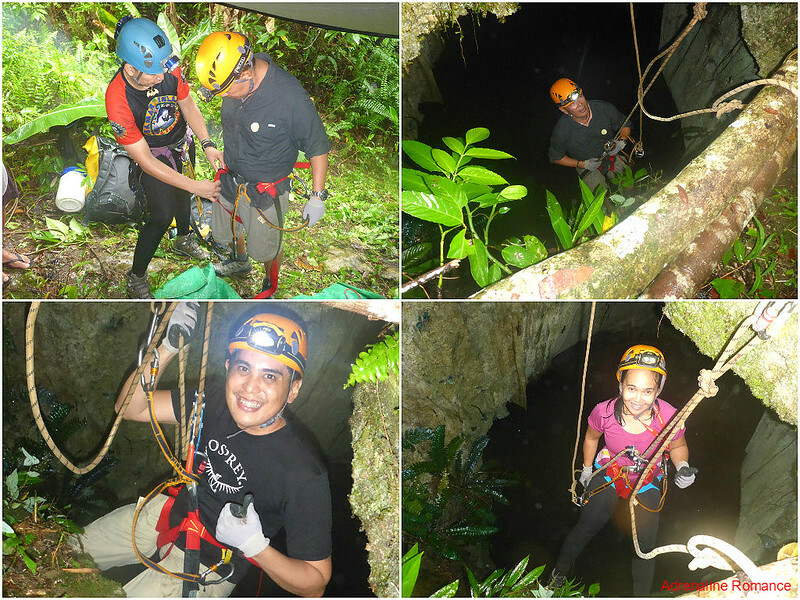 Exploring Central Cave is truly an exciting adventure! I’ve only been to Joni’s outdoor shop in Catbalogan. Thank you for transporting all of us to Central Cave. 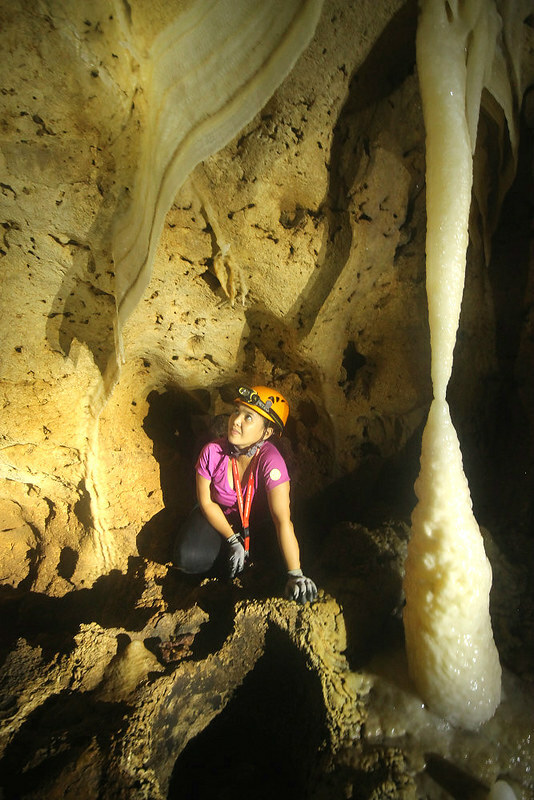 Samar is indeed a spelunker’s paradise. Wui, how are you? Long time no see! Bai, you should try out his caving adventures. Awesome beyond words!